​As a spiritual leader, there are important areas to which only you can give careful attention. Think of these relationships, which require your careful cultivation and spiritual growth, as ever expanding concentric circles. These circles of leader care are based on our Lord's Great Commission and Great Commandment, for Great Commission living is empowered by Great Commandment love. 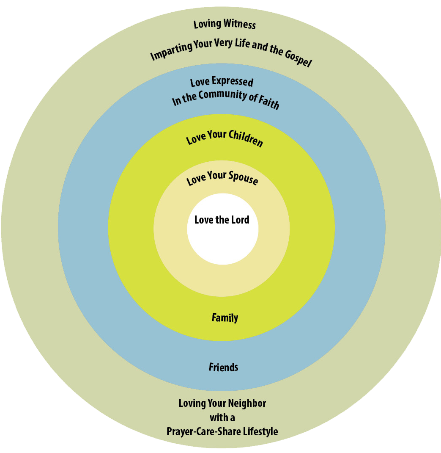 This concentric circle model of ministry reflects the heart of Care4Pastors' partners and has shaped the strategies and resources we provide. As you reflect on the Concentric Circles of Leader Care, we would encourage you to prayerfully reflect and then humbly ask the Lord: "Which of these relationships would You like to see me give more attention?" Pray a simple prayer: "Speak, Lord, for Your servant listens."